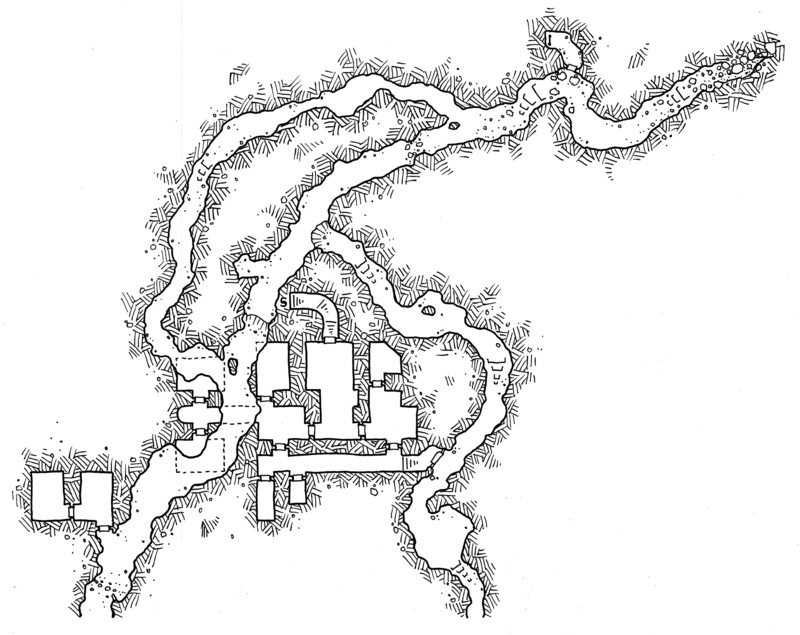 North of the Lost River Cave (West) are a pair of tunnels that were once river beds lead into the tunnels and constructions of a war party of morlocks. And then, just as I was writing this, I realized that I don’t remember morlocks in the classic B/X rules, but use them all the time since I got Labyrinth Lord as my standard reference document. Sure enough, Morlocks don’t turn up in the B/X rules, and seem closest in concept to the Grimlocks from the Fiend Folio (but statistically are very different). But anyways, Morlocks are a race of devolved subhumans (in my campaign they are actually the natural form of half elves – the few half elves in society are exceptions to this standard) who have become carnivores who prefer the taste of human and humanoid flesh. The morlocks in this area number around 50 individuals and their lair has been carved from the limestone here in a poor attempt to recreate the style and architecture of ancient elven empires. Restricted from access into the deeper areas of the delve by the ghoul acolytes (whom the morlocks have occasionally attacked and are thus attacked in turn by the otherwise very peaceful ghouls), the morlocks us a concealed passage and ladder at the very northern end of the caves to reach the surface and raid local wildlife. Morlocks became my standard humanoids in my first foray into DMing (around the time I discovered LL), effectively replacing orcs. I always made them & their haunts smell like sawdust and urine, so the players had a heads up. They normally come in a swarm and try to carry off one PC while the others fight. Man the PCs hated morlocks. I love the half-elf idea though.